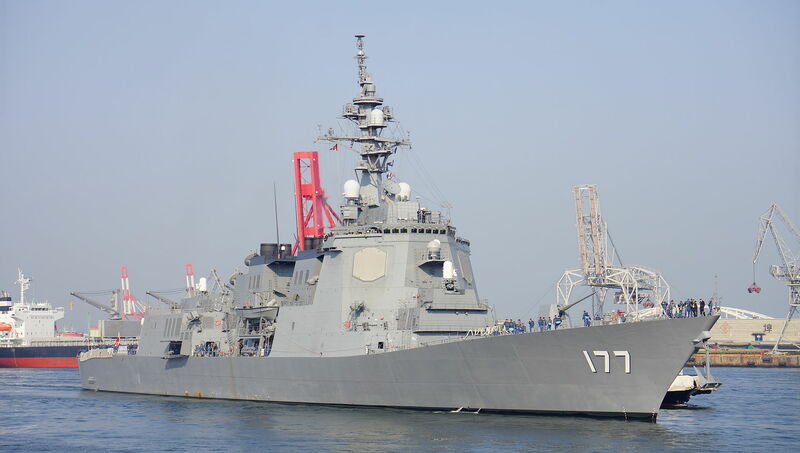 The JMSDF’s Aegis-equipped destroyers include two vessels in the Atago-class. Via Wikimedia Commons. The US Defense Security Cooperation Agency (DSCA) just published two announcements for upcoming arms deliveries to Japan. They cover a batch of SM-3 Block1B/2A ballistic missile interceptors and 32 AIM-120 AMRAAM air-to-air missiles. The total amount of the package reaches $624 million. These advanced munitions seem destined for both the JMSDF and JASDF, the naval and air branches of the self-defense forces. The exorbitant amount of $561 million for just eight SM-3 Block1B and 13 SM-3 Block2A–21 missiles total–may appear disproportionate but this is in keeping with the defense ministry’s requests from last year. Construction of Aegis Ashore sites. Upgrade the JASDF’s air control radar. Reinforce Patriot SAM batteries with PAC-3MSE missiles. Stock up on SM-3 Block2A missiles for the navy’s anti-ballistic missile destroyers. Based on the defense ministry’s latest digest a ballistic missile launch from the Korean Peninsula should be detected while at its “boost phase” or when the rocket is still accelerating. Once the missile is on course it’s already being tracked by Aegis destroyers, a ballistic missile defense (BMD) command center, and early warning radar. Neutralizing the missile is done either by the destroyers or batteries guided by Aegis Ashore sites. As a last resort, a ballistic missile on its terminal phase is taken out by PAC-3MSE’s. The need for 32 AIM-120 AMRAAMs isn’t as obvious. These air-to-air missiles are ranked among the best in the world and the JASDF does struggle with continuous bomber flights by the Chinese air force. Japan’s defense ministry have in fact ascertained the PLAAF and PLAN have made a habit of patrolling around the southernmost islands with distressing frequency. But the deterrence represented by a few more AMRAAMs isn’t the solution here. A conventional air-launched cruise missile. A supersonic anti-ship missile adaptable for shore-based defense. An intermediate-range ballistic missile with a hypersonic warhead. A new class of 3,900 ton multirole frigates. Expensive orders for US-made weapons, when coupled with the defense ministry’s own stated goals, indicates Japan is fortifying itself against China and North Korea should both countries antagonize it in the future.